While working on your vehicle can be fun and challenging, there are also times when it can be frustrating, difficult, and most importantly, dangerous. Although there is not much you can do about the difficult and frustrating part, there are steps you can take to ensure a safer work environment. One of the biggest threats you face when working on your car is when you have to get underneath it. Although having a good high-quality lift can go a long way, it’s not enough. They have several moving parts that are prone to wear and become weak over time leading to outright failure. And if your lift decides to give up on you while underneath your car working, then you’re looking at serious bodily injury and even possible death. That’s why it’s incredibly important that you always use jack stands each and every time you decide to do any work under your vehicle. Any professional mechanic will tell you that stands are a vital safety tool that must be used every time, no matter how little time you plan on spending under your vehicle. They are placed under your vehicle for support after it has been lifted and are usually made from some type of strong metal. Even if your jack fails, the stands are a fixed support that will keep your vehicle lifted and keep you safe. Buying a stand sounds simple enough, but there are several factors you should take into consideration first. Not all can support the same amount of weight, so knowing the weight of the vehicle you plan on working on is a must. They also come in different shapes and sizes, each with their own benefits. To help you make the best decision when choosing one that is right for you, we have researched and reviewed the best-selling products stands on the market! This product is a must-have for anyone who works with cars. Made from high-grade steel, they can easily support any car, sedan, or light truck that weighs up to 3 tons (6000 pounds). They come with several amazing features designed to provide you with a safe work environment including a locking rack and pawl and large saddle surface. This brand ensures you a high-quality product that passes ASME Safety Standards and comes with a one-year warranty. The purpose of these devices is to support your vehicle, which weighs thousands of pounds. This means that it will need to be made from a strong a durable material that can withstand all that pressure. These stands are made from the highest quality forged steel and a welded A-frame that provides greater stability. Not everyone is built the same and some people may need more room to get underneath a vehicle than others. 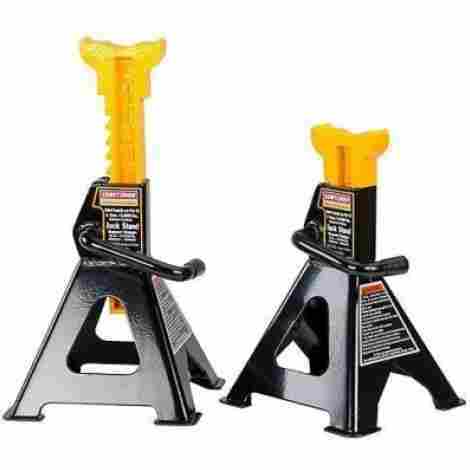 These jack stands feature a self-locking iron ratchet bar that can be adjusted from 11 inches up to 16.7 inches, making them the ideal tool for mechanics of all sizes. This product offers a fantastic price to quality ratio, which means you’re are getting a great quality product for a very low price. They meet the American Society of Mechanical Engineers safety standards and stand by their product with a one-year warranty. If you’re a professional mechanic or have a large vehicle and need something that can need something that is capable of handling those heavy duty jobs, then look no further. 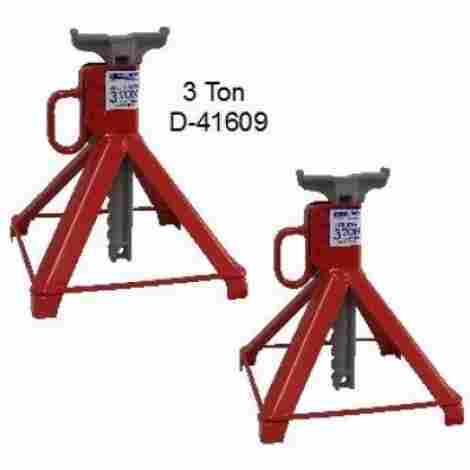 This product was built to safely support up to 6 tons (12000 pounds) of weight with a unique double-locking system that is exclusive to this brand. The body is constructed of high-quality steel and is welded to large foot base for added stability. For precise adjustments, these jack stands also comes with self-locking ratchet. Keeping them and rust free is vital in ensuring durability and preventing corrosion which can compromise their longevity. The lead-free paint that is used on these is also grease, oil, and dirt resistance and provides a long-lasting finish. Safety is the priority whenever working with heavy machinery, and Strongway understands this. They have created a patented double-lock design that takes advantage of a safety-pin design that ensures the stands stay locked in position and adds extra security and safety. These stands are sold as a pair for maximum stability and were manufactured in ISO certified facilities. Not only do they pass ASME PALD 2009 requirements, but they were created with the same systems used in the Automotive EOM sector and Aerospace Technologies. Whether you are someone who spends a lot of time on the road or just trying to organize your garage and get rid of all the clutter, Alltrade’s Powerbuilt All-In-One bottle jack and jack stand is the right tool for you. The unique patented design combines the convenient and powerful lifting force of a bottle jack with stability and safety you get with a jack stand. With a capacity of 6000 pounds, this is not only ideal for cars, sedans, and small trucks, but it can also be used for a variety of other projects as well, such as framing, constructions work, and lifting off-road vehicles. Any professional will tell you that using a car jack and jack stand together is the safest way to work on your vehicle. Alltrade uses innovative technology to combine the two and give the perfect all-in-one tool, saving you money and space while still providing all the safety you need. 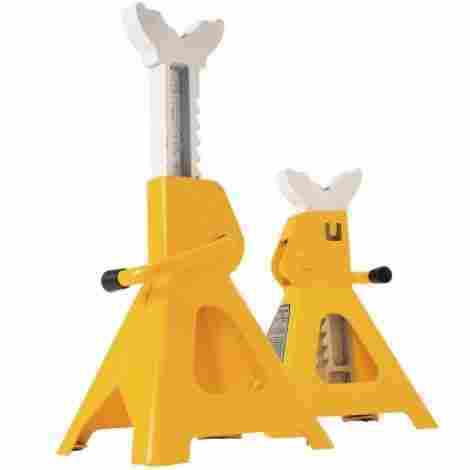 Some of the biggest differences between a normal bottle jack and jack stand are the size of the base, which provides stability, and a locking device that ensures that the tool is looked at the desired height. 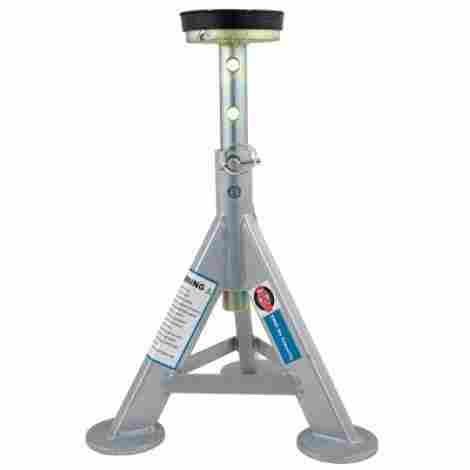 Powerbuilt is designed with an extra-wide steel base and a safety bar lock that transforms this jack into a jack stand. Not only do you save money and space by getting both, but it’s versatile and durable enough for any job that requires lifting and support. Its size makes it very portable by saving space in your vehicle’s trunk. 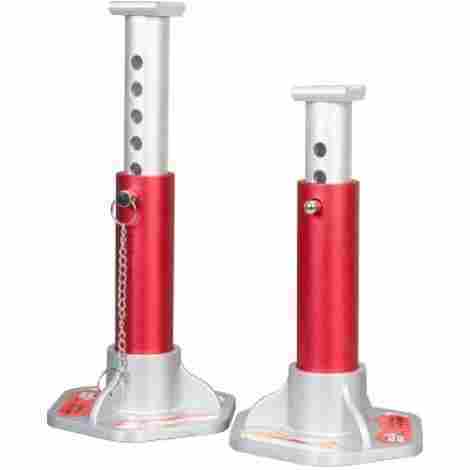 These stands from Torin are made of high-grade aluminum that makes them lightweight and portable while still providing you with the safety you’ve come to depend on from one of the top jack stand manufacturers in the world. It has a cast aluminum base that covers an area of 7.48 inches by 6.81 inches, providing you with stable support. It features an anodized finish that protects it from rust and corrosion and five holes adjustments that gives it a lift range from ten and two third inches up to fifteen and a half inches. Unlike steel and iron, aluminum is a lightweight metal that is strong enough to support up to 6000 pounds. The fact that it can break down for storage combined with its light weight, these are the ideal portable option. When you’re working under your car, you can be sure that there will be some shaking and moving going on. Torin designed their aluminum products to have a larger saddle surface for better contact with the vehicle and a large base for maximum stability. The tubing is made of high-grade aluminum, which is not only extremely strong, but also meets the American Society of Mechanical Engineer’s standards for safety. If there are any issues, this company offers a one-year manufacturer warranty to ensure your satisfaction. With a capacity of three tons and a rubber pad for protection, this product is ideal for working on classic cars and other vehicles which need extra attention to avoid scratches. This professional-grade product features a powdered coated base that stops corrosion that can damage the structure and affect its strength. The base pads are circular so they can cover more space and increase stability while preventing the jack stand from sinking into the ground. If you’re a car collector, then you understand how important it is to keep your vehicle in pristine condition. The removable rubber saddle pad was designed to prevent any nicks or scratches to the paint much better than the usual curved axle post. The more surface your stands cover, the better the stability. Esco uses a simple, yet effective tripod design with circular base pads that not only covers more area than the traditional straight options, but also works better on irregular surfaces. This is a professional grade, all-steel product that features a pin lock design that makes it easy for anyone to use. It also forgoes the traditional enamel paint finish you find on most jack stands for a powdered coating that resists rusting and corrosion. If you’re looking for a pair of heavy-duty stands that are both affordable and reliable, then this set is perfect for you. They have a lift range that starts at 11 ¼ inches and goes up to 16 ¾ inches, which allows you the room to work comfortably underneath your vehicle. Constructed with strong and durable steel, they can easily support up to three tons, making them the right choice for working on cars and small truck. You never know when a car problem is going to come up, and unfortunately most of these problems happen while you are on the road. At just under 16 pounds, these are perfect for storing in your trunk for whatever emergency might pop up. What’s better than using a stand to support your vehicle while working? Using two of them supporting your vehicle. Whenever you lift your car and place it on a support system like this, it’s better to have more points of contact for better weight is distributed and for greater stability. For a surprisingly low cost, you get two with reliable construction and adjustable height. Performance Tools is so confident in the quality and build of their product that they even offer a full manufacturer’s warranty. For the really tough jobs, you’ll want to consider this 6 ton capacity double locking stand. Whether you plan on using it at home, in a professional environment, or on a farm, you can depend on the solid stamped steel construction to hold up under the pressure. The top of the line cast ductile iron ratchet bar provides extra durability and safety by bending when under too much pressure, unlike other metals which break. This product uses a double locking system that provides extra safety when you need it most. The pawls are counter weighted and act as a secure locking device that stops your vehicle from accidentally disengaging. Ductile Iron is more flexible and less likely to break when under too much weight, making it a much safer material to work with. The one piece, multi-position ratchet bar also acts as an adjustment mechanism which can be locked at the desired height. 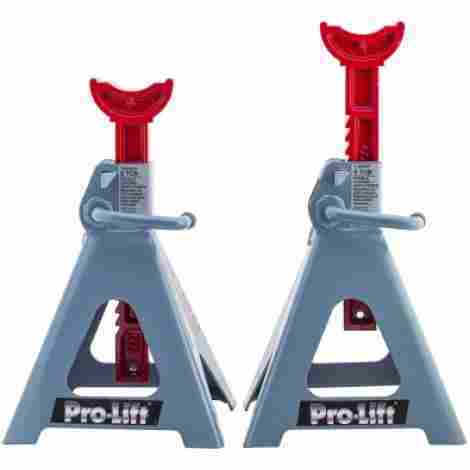 These double-locking jack stands by Pro Lift not only meets, but exceeds the Safety Standards for Portable Automotive Lifting Devices and the American National Standards Institute standards. They are made from high-quality metals, yet are surprisingly low priced. Out of all the jack stands on this list, these are the only that are made 100% in the USA will 100% USA parts. 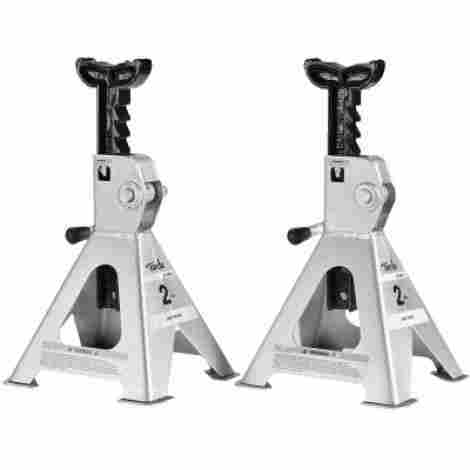 These heavy-duty jack stands feature ductile iron support posts, which is less brittle than the cast iron posts found on most traditional jack stands and is the brand that is used by Boeing, Lockheed Martin, and the United States Military. Each stand is tested with 1 ½ times the weight stated for the rated capacity and comes with a wide base that has four points of contact for maximum stability. When your safety is concerned, US Jack takes no chances. Their garage stands were designed for professional use and features a double lock security design that uses two ratcheting pawls to connect two teeth to the load bar for extra security. It’s a fact that wider bases are more stable than narrow base stands, and these not only have a wide base, but they each have four points of contact with stamped legs that are secured together by a perimeter ring that is welded on. There is nothing more valuable than your life, and US Jack uses the highest quality steel and iron in their products to ensure durability and longevity. Although these come on the higher end of the price range, you can rest assured that each stand is tested before they go out. Craftsman has been manufacturing high-quality performance tools for professionals in the auto industry for over 90 years and continues to deliver innovative products that are designed and tested to exceed your expectations. 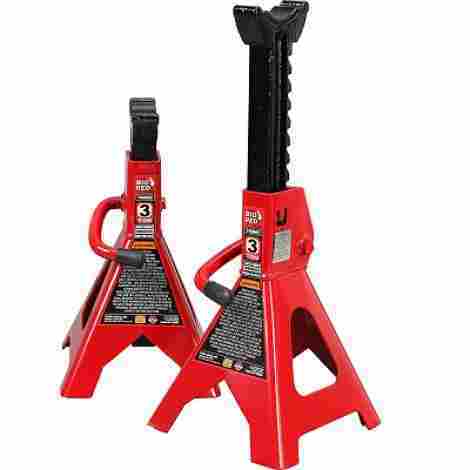 These professional-grade four ton jack stands are a perfect example as they feature a strong alloyed steel construction and rugged welding that can support up to 8,000 pounds. Steel’s biggest enemy is rust. If not properly maintained, rust can form and begin to corrode, stripping away the metal’s strength. In order to avoid this issue, Craftsman uses a baked on enamel coating that protects the metal and ensures that the jack stands stays strong and durable for many years to come. Adjusting the height of your jack stands has never been easier with Craftsman’s unique height adjustment mechanism which uses counterweighted pawls for smooth movement and automatic locking to avoid slippage. Craftsman is a brand that is trusted by professionals all around the country and continues to live up to their reputation with these four ton jack stands. The solid stamped steel construction meets all the latest standards set by ANSI/PALD. 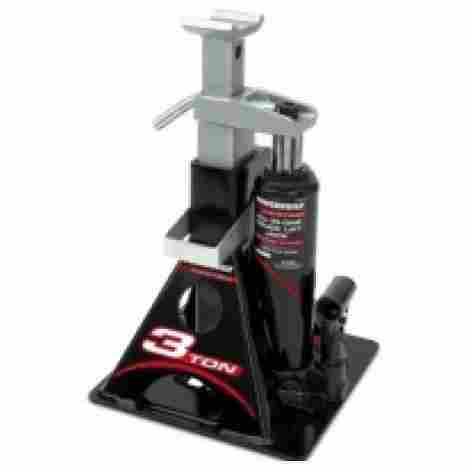 Tonda is a brand that specializes in the production and development of stands and other similar automotive tools such as floor jacks and bottle jacks, selling more than three and three and a half million products a year. 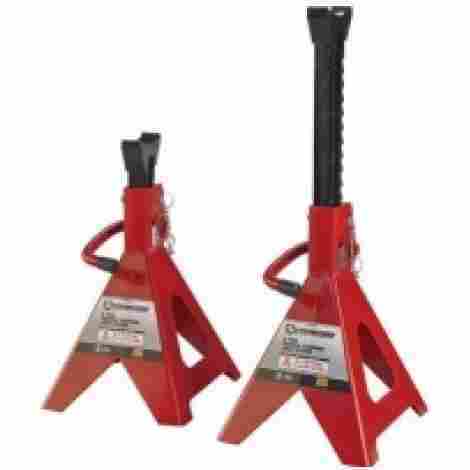 Their two ton steel jack stands were designed to meet the safety and performance standards you would expect from a world-class manufacturing association. The thing about these devices is that you never know when you will need to use them. That’s why portability is such an important factor. Tonda’s 2 ton stands features handles that were specially designed to act as a saddle column lock and provide easy portability. When you’re working under a vehicle that weighs thousands of pounds, you want to make sure that it is properly supported. Tonda built these with rust resistant, cast iron support arms that feature oversized saddles that provide extra contact with the vehicle for increase stability. This heavy-duty product features a welded steel body, thick cast iron arms, and a rust resistant finish that increases its tool life. They also meet all the standards set by ANSI/ASME PALD 2014. Every year people get injured, and sometimes even die, while working on their vehicle simply because they were not using the proper safety equipment. Jack stands are simple tools, but effective and necessary ones. They are a must-have for anyone who works with vehicles, but they can also be used for jobs in construction and farming. The products reviewed above are some of the best that you can find, and each offers their own unique benefits. Find the one that best suit your work needs and always work safe! Aluminum – This is the lightest metal of the three and ideal if you-re looking for portability. Aluminum also has the advantage of being corrosion resistant. Steel – Steel is a very durable metal and is also very affordable. Most stands on the market are made of this metal. Iron – Iron is the strongest of the three, but it is also the heaviest and most expensive. Since its only job is to support a heavy load, knowing its load capacity is vital. Not all options can hold the same amount of weight, so you need to take into consideration the types of vehicles or jobs you will be using it for. Load capacity can vary from half a ton (1000 pounds) up to 25 tons (50,000 pounds). It’s suggested that you get one that has a higher weight capacity than the vehicle you will be using it for. Fixed height – Fixed height stands that have no moving parts, which means that they can’t be adjust to different heights. The advantage to this is that you never have to worry about a mechanical failure that causes the support arms to fall. These types are ideal for using in one place, like your garage or other work environments where the setting will always be the same. Adjustable Height – Adjustable height stands are great for portability since they are more compact and can be used for uneven surfaces. They either use a ratchet system or a pin lock system to adjust and secure at the desired height. The purpose of a stand is to not only safely support your lifted vehicle, but to also allow you to work comfortably while underneath. The lift height refers to the maximum height it can safely support your vehicle. It’s important to know this because not all stands have the same lift height. You’ll want to ensure that you have lots of clearance space under the vehicle so you can easily fit under and work. Too tight of a squeeze is not only inconvenient, but it can cause fatigue and make it harder to complete your job. Adjustable stands uses a lock mechanism that allows them to stay set at the desired height, but not all have the same lock design. Ratchet Lock – Ratchet lock is a mechanical device which uses a pawl to allow linear movement while preventing the supporting arm from moving back in the opposite direction by engaging with the teeth. Most tripod shaped stands use this type of lock design, which is great if you need precise height adjustment. The height can be adjusted at small increments and allows you position the stand underneath different parts of your vehicle. Pin Lock – Pin type stands uses a locking pin that is inserted through the top base and the adjustable tube at predetermined slots. This type of locking system is very reliable and sturdy. It also makes removing it easy as you only need to lift your vehicle high enough to take the pressure off so you can remove the pin and release the support arm. The problem with pin locks is that the height increments are predetermined and sometime they can be far apart. Too much pressure can also bend the pin and make it difficult to remove. As an emergency tool, your stands need to be versatile and easy to use. Not everyone is an experienced mechanic, and even if you are, an easy to use device just make your life that much easier. Look for models with good reviews and easy to follow instructions. Sometimes a ton of extra features is just not needed for a simple tool like this. Q: When is the best time to use these? Every time you plan on jacking up your vehicle you should use stands. Even if you don’t plan on getting underneath, if your vehicle slips and falls or your device fails, you can still get harmed or cause damage to the car. Now, if you do plan on getting under your vehicle, then it’s vital that you use stands each and every time, no matter how short of a period you plan on being there. Q: I have a pretty good floor jack, do I still need to use stands? Jacks are designed to lift vehicles, not support them. They have many moving parts, which increases the chances of something going wrong. Their parts can also wear with time, causing failure, and hydraulic systems have been known to leak. Another benefit of using these devices is that you have more than just one point of contact. The more points of contact you have with your vehicle the better the overall stability. Q: I’m looking for a pair of stands, what should I be looking for? That mostly depends on your needs. For example, one of the first things you want to look for in stands is the material used for its construction. Aluminum is great for portability and supporting lighter vehicles like cars, sedans and smaller trucks. While steel and iron are great ideal for professional settings and heavy-duty jobs. A stand that is composed from one piece of metal is also a big plus as this provides for more durability. Other factors you need to take into considerations are lift height, load capacity, and ease of use. This is a very important question because although they look simple enough to use, you need to take all the proper precautions and follow all the steps to ensure maximum safety. The first thing you need to do is park you vehicle on a flat, hard surface that is free of debris and oil. This will ensure that your stand has good contact with the ground. Jacking your car up on soft or uneven ground can lead to accidents and slips and cause serious or fatal injuries. Ensure that your car is parked and that the parking break is entirely engaged. You want to block your wheel from moving by using wheel chocks, which will prevent your car from rolling while lifting it up or working on it. Insert the wheel chokes on both sides of all the tires that will remain on the ground. This is a very important step that many people skip, especially if you are lifting on the back side of your car since that’s usually where the park breaks are located. Before using the deviceyou want to make sure that it is working properly by testing it first. Use your hands and feet to see if it lifts and releases properly. This would also be a good time to test your stands as well so you’re not lifting your vehicle for no reason. Check that the handles and locking mechanism is working the way it should. For maximum stability, you will want to use one stand for every wheel that will be off the ground. You always want your vehicle to have four points of contacts to the ground. Refer to the vehicle’s owner’s manual to find the jack points. These are reinforced areas that were designed to hold the weight of your vehicle. If you don’t have an owner’s manual, you can always do an online search. Not using the proper points can be dangerous and also damage your car. Make sure that the weight capacity of the jack and stand is more than enough to lift and support your vehicle. Place it under the jack point and lift your vehicle to a height that allows you to comfortably work and accomplish your job. Adjust them to the desired height and place under the suggested points corresponding to the lifted wheel. Make sure that the surfaces of the stands and vehicle are clean, flat, and solid. Use your hands to ensure that the stands are secure and steady. You should also shake your vehicle to check for stability. After you have finished your job, place the jack back under the point and slightly lift your vehicle until it is no longer resting on the stands and remove them.